The integral part of the expression is the second moment of area of the shaded portion of Fig. 3.24 about the vertical axis. Thus, determination of this quantity for a given >'max value yields the corresponding value of the applied torque T.
As for the case of inelastic bending, the form of the shear stress-strain curve, Fig. 3.24, is identical to the shear stress distribution across the shaft section with the y axis replaced by radius r.
The procedure for determination of residual stresses arising after unloading from given stress states is identical to that described in §3.9 and §3.14. For example, it has been shown previously that the stress distribution across a beam section in inelastic bending will be similar to that shown in Fig. 3.23(a) with the beam depth corresponding to the strain axis. Application of the elastic unloading stress distribution as described in §3.9 will then yield the residual stress distribution shown in Fig. 3.25. The same procedure should be adopted for residual stresses in torsion situations, reference being made to §3.14. Fig. 3.25. Residual stresses produced in a beam constructed from a strain-hardening material. An overload causing yielding produces residual stresses which are favourable to future overloads in the same direction and unfavourable to future overloads in the opposite direction. This suggests that the residual stresses represent a favourable stress distribution which has to be overcome by any further load system before any adverse stress can be introduced into the member of structure. This principle is taken advantage of by spring manufacturers, for example, who intentionally yield springs in the direction of anticipated service loads as part of the manufacturing process. 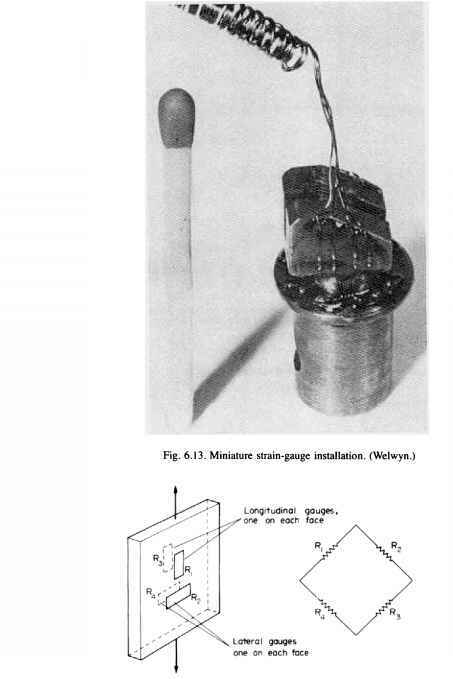 A detailed discussion of residual stress can be found in the Handbook of Experimental Stress Analysis of Hetenyi.^"
t R. C. Juvinall, Engineering Considerations of Stress, Strain and Strength, McGraw-Hill, 1967 t M. Hetenyi, Handbook of Experimental Stress Analysis, John Wiley, 1966.